When it comes to the basket-flower (Centaurea americana), the intricately woven basket is only the beginning. Equally appealing are the pink, purple, or white flower heads that appear to be beckoning insects and humans alike to have a closer look. Colonies can be a blur of color, but individual flowers deserve a second glance, or to be viewed from a different angle. Here, a basket-flower glows against a sandy county road. This slightly unkempt specimen from a suburban ditch seems to be having a bad hair day. Meanwhile, in the shadow of an abandoned power plant, the inherent elegance of the flower shines. One of our most beautiful natives, basket-flowers help to make the transition into the heat of a Texas summer almost bearable. There is so much beauty in flowers when we look very closely at them. That’s true. Something that basket-flowers have in common with your bear grass is their size. Because they’re larger and taller, it’s easier to view them this-way-and-that than it is with the smaller — or even tiny — flowers. They’re great fun to play with. Great shots! The 2nd one does have kind of a Phyllis Diller hairdo, but it’s still pretty. And the round one is cool. At one point, I used the word “frowzy” to describe the second flower, and if anyone embodied the essence of frowzy, it would be Phyllis Diller. Once the flowers start going over the hill, they’re just as interesting as they are with those perfect blooms, and when they’re fully dried up, the structure takes center stage again. They’re quite a satisfying flower, in every stage of life. Wild flowers are often prettier than their “tame” counterparts. I’d like to get some cone flowers and basket flowers started in my flower beds. Wild flowers are often much hardier than the cultivars, and when they self seed, they breed true. . Because they are deliberately bred, cultivars can be developed that don’t breed true, or set seed that is poorly viable. This ensures you’ll grub them up and buy new plants next year. As it happens, I’m going to be collecting basketflower seeds from the power plant colonies this weekend for a friend in the hill country. If you’d like some, just let me know. It’s an easy place to collect, because the stands of flowers are so thick along the abandoned roads there. As for cultivars, some are very nice, and there are non-native plants that can complement a garden. Still, when it come to beauty, attractiveness to pollinators, and simple sturdiness, the natives can’t be beat. The first and third pictures are nice abstractions. I can’t think of a worthier native wildflower to get that treatment. I was going to show three abstractions, but decided against it, since not everyone’s famliar with the flower. When I looked at the center of the last photo and saw that spiraling, I wondered if Fibonacci numbers are involved, as with the sunflower. Because of the way basketflowers open, it’s a little harder to get a sense of the structure, but whether yea or nay on the Fibonacci sequence, it surely is attractive. 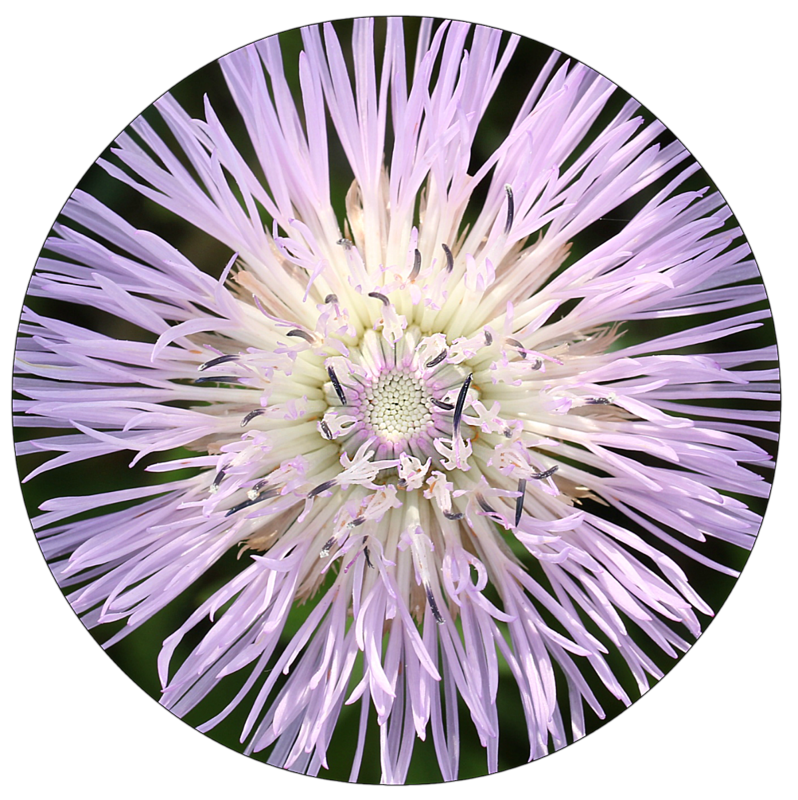 I enlarged the center of a basket-flower in one of my own pictures and counted 13 counter-clockwise spirals. I couldn’t discern the spirals in the other direction, but 13 is indeed a Fibonacci number. I’m not surprised, given that Centaurea belongs to the sunflower family. I might not have paid attention, but in the process of unconfusing myself about the basketflower’s structure (as you know, it’s all disk flowers rather than all ray flowers — I’d been deceived by its appearance) I noticed the spirals. Finding a pattern in a new place is delightful. Speaking of delights, I spent today in Galveston and Brazoria counties with a friend, and found the prickly pears finally covered with yellow blooms. Even better, the wildlife refuge was awash in bluebells and eryngo. I’ve never seen bluebells there, and only a few eryngo. Clearly, another trip is in order: solo, so I can dawdle, and soon, before the flowers fade. We seem to be in different countries. The prickly pear flowers in Austin have been gone for a couple of months. I did see a few at the Alibates Flint Quarries in the Panhandle a month ago. When it comes to bluebells, though, I’ve been on the lookout but haven’t yet seen any here. These three pics are marvelous. So much beauty in the basket flower. The blooms dry really well. I think they are pretty even when colorless. Nice to put some in a vase. Lovely shots almost inspiring me to pick up the camera…. After today, I’d be more than willing to make that trade with you. This is the time of year when people start muttering about how it’s “only three more months to October.” I hope your cold moderates, so your outings (with and without critters) can be pleasant. And take that camera! Your photos always delight, no matter the subject. Beyond that, they help us keep up with you. Now that you’re truly mobile, there’s no telling where you are, but wherever you are, there surely is something lovely or interesting to record. I do hope all’s well. We’ll be patient! The bad hair day is perfect for me! I’m not sure purple’s your color, but I think the casual look is just right, GP. Thanks for the grin! What a beauty. Love the abstract look of the first image. Thanks, Vicki. I’ve always enjoyed views of a basketflower against the sky, but when I realized I could use a little sand and gravel for a background — well, why not? I thought it worked well, and it served as a good reminder for me about the difference a background can make. I wish I’d done better at getting the entire flower in sharper focus, but now that I have the concept in mind, I always can try again. I remember Peggy’s curly hair — with the same degree of hair-envy as before. I suspect her bad hair days would be the envy of many of us — and you can tell her I said so! It still amazes me that one flower can look so different, depending on the perspective from which it’s viewed. I suppose that’s true with everything in life, but a camera helps to bring the lesson home in a whole new way. I’m fond of that first image, too — I’m glad you found it pleasing. Same for me, too with flowers being so different when viewed in different ways. 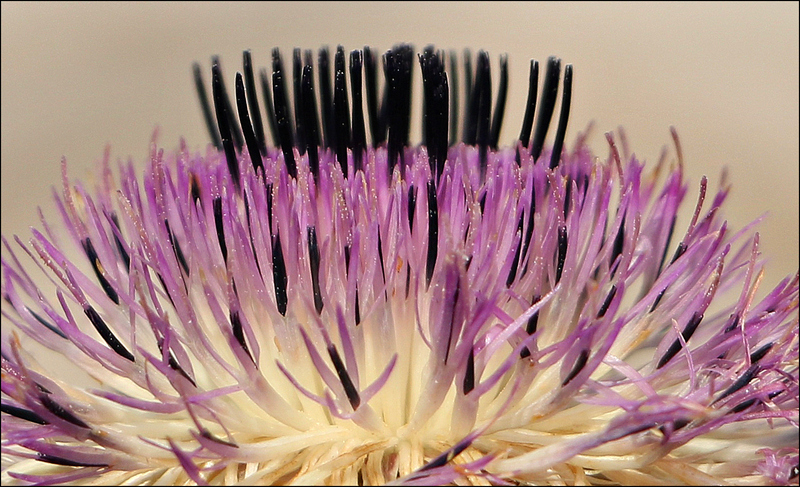 Great photos–thanks for getting the different views of this flower. I’m always taken with the complexity of a flower and your photos demonstrate that beautifully in this one. It occurs to me that the best song for photographing a flower in all its stages might be, “Getting To Know You.” We can learn a lot from books, but there’s nothing quite like experiencing the way a flower bends in the wind, or how its color varies, or what kind of neighborhood it prefers. It intrigues me that, once I’ve spent a good bit of time photographing this or that flower, I can spot it while going sixty on a highway, or prowling through a bayou. How it happens, I don’t know — but it does. At this point, that only happens with a few, but I’m “getting to know” more day by day. Linda, you really should do something with these beyond the blog. They’re just fabulous. A series of cards, perhaps? Other publications. I am in awe. Bravo. Thanks, Jeanie — I’m glad you enjoyed them. None of these is print-worthy, but some day I’ll have some that are. That’s what practice is for. In the meantime, I certainly am enjoying getting out and about with my “seeing eye camera” to record the world. I’m sure you’re up at the cabin, and I hope you’ll do a bit of the same thing with that nice new camera you have. By the way, when I was out and about yesterday, I saw another brand new sight: an adult great blue heron with two young ones (about half the size of the adult) out in a marsh. They were well beyond the reach of even my 300mm lens, but at least I got to see them. Now that I know they’re around, I’ll look for them when I go back this week. Home for a few days — Rick’s birthday is this weekend and easier to do the kids here than up north. Nice to catch up on things but I realized what I mess I left the house and it’s overwhelming to me! When I saw you roaming around, I thought you must be home — since the library wouldn’t open this early! Some things are easier to do in one place or another. Tell Rick happy birthday for me — such a happy occasion. As for the house… well, that’s the way it goes. I always try to have things tidied up before I leave, but it usually doesn’t happen. If I get the trash out and the refrigerator sorted, that’s usually about it. But I always swear that next time I’ll do a better job of being organized. That’s why I keep the framed envelope my mother left behind close by at all times. For whatever reason, she wrote, “Being disorganized is not a moral problem.” So there! Words do make a difference, don’t they? I mentioned to Robert that I almost used the word “frowzy” to describe that bloom, but “touseled” would work, too, and that evokes an entirely different set of associations: far more positive, and more in line with your interpretation. Neat-and-tidy is fine, but I’d take this field of unkempt and random flowers over a formal garden any day. It’s a little like your cornflower because it’s in the same family! 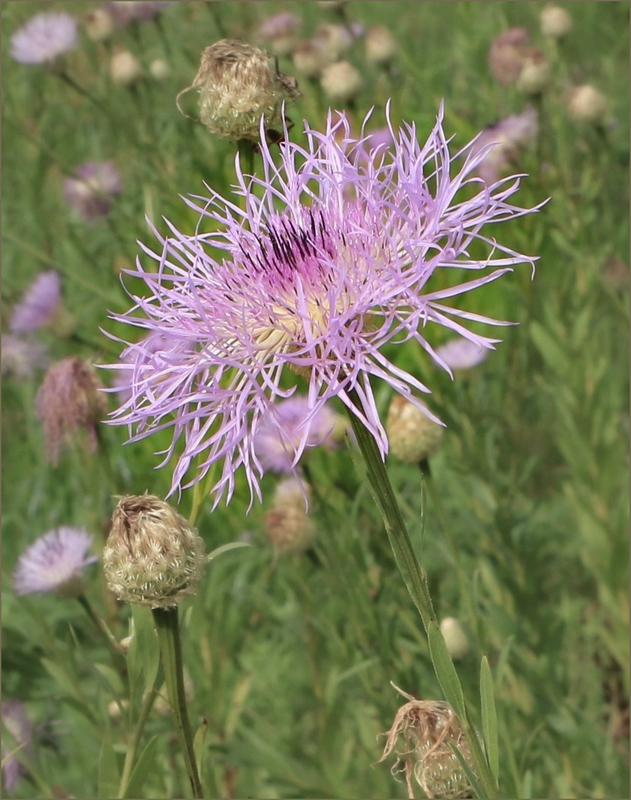 Yours is Centaurea cyanus, and it also has the common name of bachelor buttons. I grew up plucking those from my grandmother’s cutting garden, which probably helps to explain my fondness for this flower. When I first was attracted to it, I didn’t know about the association. Then I learned about it, forgot it again, and relearned it through this year’s experience with the flowers. It’s interesting how we can learn some facts, but they don’t stick — for whatever reason. Then, we come around to it again, and finally incorporate the knowledge. I’ve noticed that the flowers I favor, and photograph most, are the ones whose scientific names stick. I can’t believe I forgot I’d posted these photos. I’m glad you enjoyed them. It’s interesting to see that the photos were taken at nearly the same time each year. This year’s flowers faded a little more quickly than I would have liked, but I suspect that was due to that extended period of hot, dry weather we had.